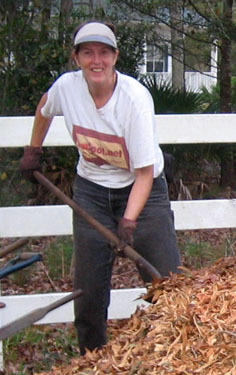 The main purpose of this log was to expand on the gardening adventures that Ginny wrote about in her Adventures of a Transplanted Gardener columns, but now she writes at The GreenGardeningMatters blog. 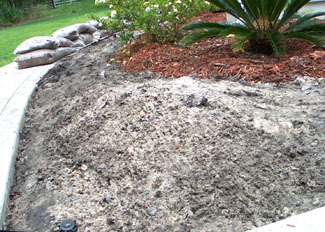 When we redid the whole front bed, we removed all the lava rocks and filled in with sand before covering with weed barrier. 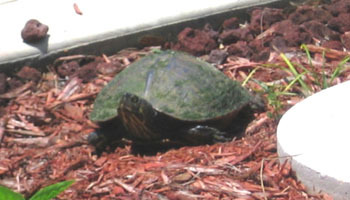 (See my French drain article for more details on this.) We decided to create a cactus garden at the point where the front walk meets the driveway, since it gets so much sun. So we added extra sand to provide a nice mound for more interest and to make sure that the cactus never end up with wet feet. We covered the sand with weed barrier and then added the washed lava rocks. We arranged four larger lava stones to provide background and focus points in the arrangement. 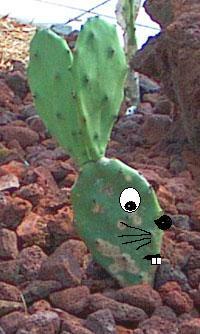 Finally, we planted the Prickly Pears and one red topped cactus that had been languishing in a little pot. Despite being out of the ground for a week or so while we worked on redoing the beds, a couple of them bloomed. 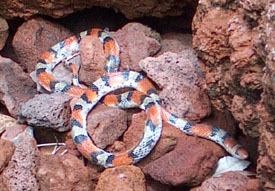 It wasn't long before we started seeing a little Scarlet Snake (Cemophora coccinea) sunning itself on the rocks. This is not a Coral Snake, but it mimics the color scheme to keep predators at bay. The rhyme to remember is: "Red on yellow can kill a fellow, Red on black, it's okay, Jack." It's good for the garden to have a few snakes hanging around to eat bugs and rodents. The balance of nature. 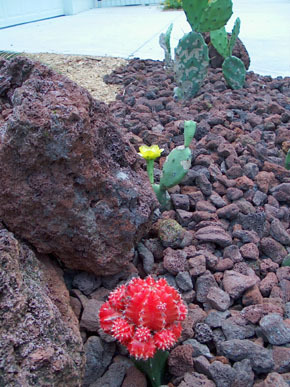 All of the cactus plants do very well without any watering, which is a plus if the rains slow down. Whenever you work with cactus remember to wear your leather gloves, because those barbed prickles don't come out of your skin easily. << Prickly Pear Point!! We like it. Looked out the window and what did we see? 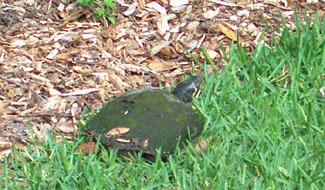 A Common Cooter - we looked in a book. Put everything back, layered like a cake. Her great adventure - hope to see it next year. Bulbs from Clarice who lives down the street. 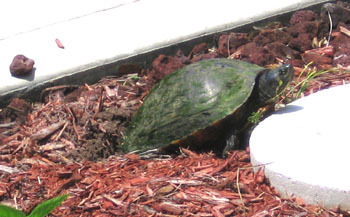 Will babies find the pond on our lot? The balance of nature - we'll post photos here. 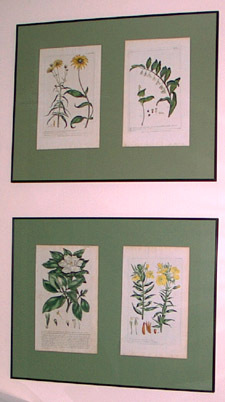 5/4/05: --those wonderful old, hand colored prints that illustrated field guides in the days before sophisticated color printing--I'm always on the look out for them. 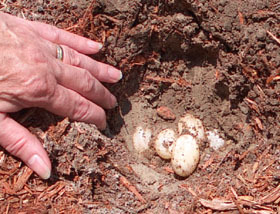 Recently, my friend Lucia Robson picked up three(!) for me at the Goodwill Store. My office now has a full complement of botanicals and other plant stuff hanging on its walls. 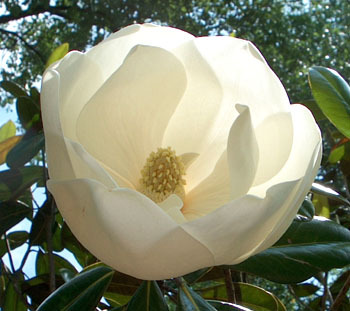 It makes me smile and inspires botanical thoughts as I write, whether it's gardening subjects or not. 4/25/05: Ferns, ferns & more ferns. I've loved ferns from the time I went to day camp as a young Girl Scout and in the seventies, I embroidered ferns on my jeans and other clothing. 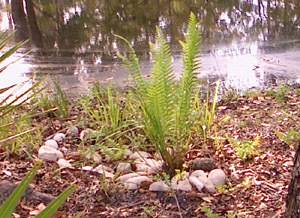 I was delighted to find many ferns growing on our lot here in Florida and I'm always looking for more places to grow them. 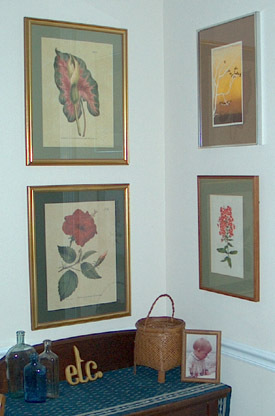 You may read the Fern column, but I wanted to post some of other fern projects here. 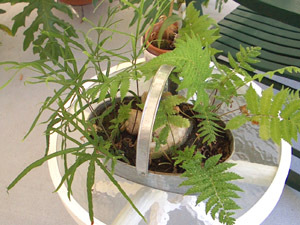 One small project was to create a small fern garden in a metal bucket for our screened porch. I put gravel in the bottom since there is no drain-hole, even though ferns don't mind wet feet, it's better to provide a space out of the dirt for the surplus water. I pulled these three small ferns from the cracks in the bulkhead by the lake. The two on the right are probably Virginia Chained Ferns (Woodwardia virginica), but hard to tell until they mature. The other little fern with the strappy leaves is a Walking Fern (Camptrosorus rhizopyllus). It's the only one I've seen around here. 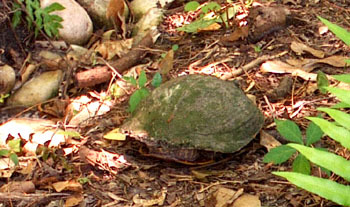 It gets its name from its habit of rooting at the tip of a frond that finds itself pressed into the soil. A new, cloned plant arises from that point, hence it walks, albeit slowly, across the landscape. I'll plant it outside somewhere when it outgrows the bucket. 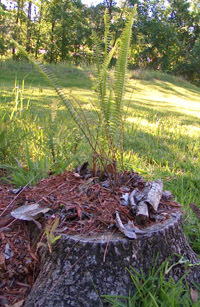 We have a number of stumps left after the hurricanes and instead of expensive stump removal, we've decided to let the ferns do the work for free. 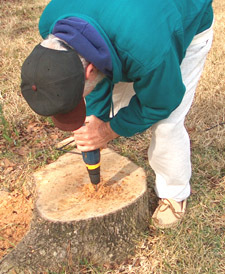 First, my husband drilled a series of big holes in the stump and then I chopped out a basin with an axe. I filled the resulting depression (about 10" in diameter and 6" deep) with soil and pond muck. I kept it moist for a few weeks to let the fungi set up shop. (See the Stinkhorn Fungi article for more information on soil fungi.) 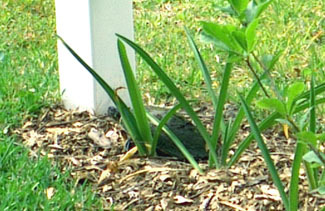 Finally, I planted three Ebony Spleenworts (Asplenium platyneuron) in the hole and piled up mulch around the area. The stump grinder would have been faster, but this area of the yard doesn't get enough sun for an effective lawn and the stump marks the corner of the back field area where we no longer mow. Watch for a de-lawning article one of these days. 4/10/05: Several readers wanted more details on the rain gardens. 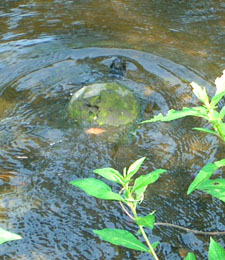 Okay; the fake river rocks were sitting in the edge of the woods on a rotting pallet-leftovers from the gas fireplace when they built our house. 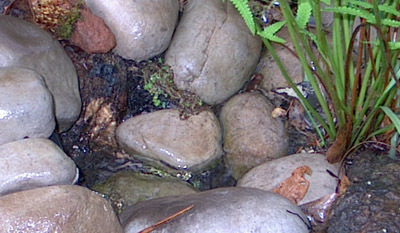 You can buy rocks at Home Depot, but better selections are available from garden shops specializing in water gardens. The rain garden next to the pond seemed to be the hardest to visualize. 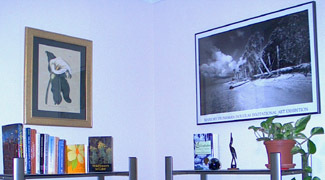 So here are some more pictures: To the left a photo from its top. The pipe from the French drain is just this side of the Cinnamon Fern (Osmunda cinnamomea). I risked getting my camera wet and being struck by lightning (a Sky-Bolt!) to take photos during a heavy rain. Below, water flows on top of rock lined pathway. To the right, at the top right is the pipe and to the bottom left is the pooling area in its full state. The ferns and rushes below this area slow and absorb the overflow. 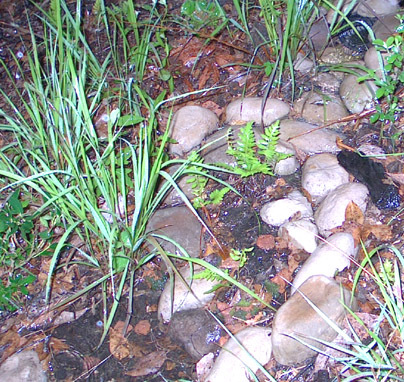 4/6/05: I removed many clumps of rushes from the lawn and planted them in my new rain gardens and along the edge of the pond. Rushes love wet feet. Read my rain garden article. 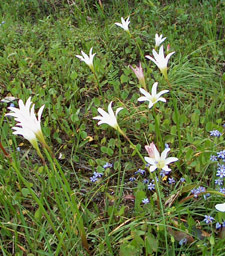 I was pleased to find an abundance of Rain Lilies (Zerphyranthus atamasco) and Blue-eyed Grass (Sisyrichium angustifolilum)-which is not a grass, but a small blue-flowered gem in the Iris family. They were growing in standing water in a drainage ditch next our lot. I noticed that many of the road-side drainage ditches support these beauties. The county mowers have been through the ditch on a regular basis. When removing plants from an existing population always take them from the middle and overcrowded sections and replace your divot like a golfer. Leave the edges of the population alone so it may expand naturally. If there are no overcrowded areas and if there are only a few individuals, don't remove the plants unless you are saving them from destruction. 3/19/05: Rain barrels at our potting bench area save time, water, and the environment! When we moved into our new house in Florida, the perfect place for our potting bench--next to the garage--didn't have a spigot. 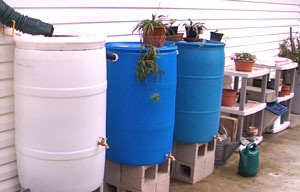 So my husband and I created a source of water with these three tandem rain barrels. Read the rain barrel article. Some alert readers pointed out that the words to that old song are "Holler down my rain barrel," but I remember singing "Climb up my rain barrel," at Girl Scout camp.